The Pediatric Brain Tumor Foundation continues to deliver on its commitment to equip, educate and empower childhood brain tumor families by launching its fourth chapter, serving the Northeast region of the United States. Multiple studies have shown that children and teenagers diagnosed with brain tumors face lifelong and wide-ranging side effects caused by their illness and treatments, including motor, sensory and behavioral difficulties, challenges attaining independence and an increased risk for developing secondary cancers and other health conditions. In particular, a 2017 St. Jude study found that the cumulative burden of chronic health conditions was highest in brain tumors and central nervous system cancers, compared to other childhood cancers. Under the leadership of Managing Director Kimberly Roy-Canning, the Northeast Chapter will partner with families, supporters and medical institutions in the region to grow mission programs and bring important PBTF resources to children and families. Roy-Canning joins the PBTF from the Connecticut Brain Tumor Alliance, Inc., where she served as the CTBTA’s first Executive Director for more than six years. The Northeast Chapter joins the PBTF’s chapters in Georgia, Illinois and California as local families’ first line of support through their child’s brain tumor journey. The PBTF’s Butterfly Fund, which provides emergency financial assistance to families whose children are in treatment at partnering medical facilities, including Dana-Farber/Boston Children’s Cancer and Blood Disorders Center and Children’s Hospital of Philadelphia. In addition to helping with expenses during treatment, the fund provides support for professional counseling services. The Imaginary Friend Society, a series of more than 20 animated films that teach children about cancer treatment in ways they can understand. Produced by pro-bono partner RPA and recently honored with two Cannes Gold Lions, these videos cover topics like “Losing Your Hair,” “Chemotherapy” and “Returning to School.” The Imaginary Friend Society’s new augmented reality app also brings its characters to life in hospitals and cancer treatment centers to reduce stress. The Starfolio Resource Notebook, which equips newly diagnosed families with information to help them partner with their child’s healthcare team. The portable, zip-up binder contains basic information on childhood brain tumors and templates and tools families can use to collect and keep track of treatments, medications, patient education materials, information sheets and copies of scans. Community events, such as Ride for Kids motorcycle charity rides, Starry Night walks, Vs. Cancer sporting events and Meet the Experts programs. These activities give families the opportunity to connect with and learn from others who are navigating similar issues. The PBTF is no stranger to the Northeast region. For more than 25 years, the PBTF has hosted Ride for Kids and Starry Night programs across the Northeast, rallying families and supporters in the fight against pediatric brain tumors. Adding a chapter in the region will help grow these events, while introducing new opportunities to unify the local community. 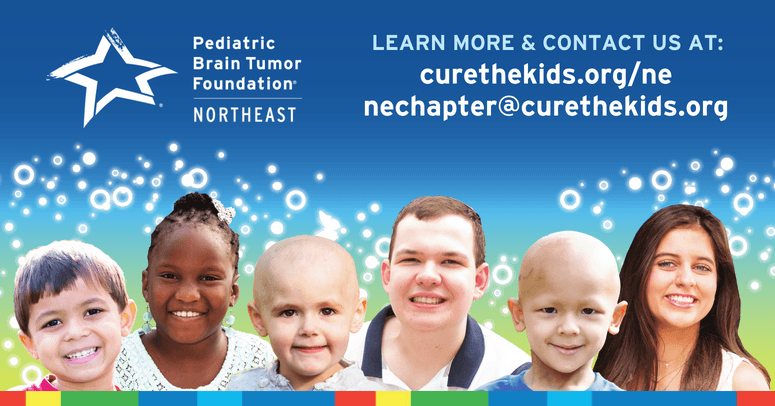 Visit www.curethekids.org/ne or email nechapter@curethekids.org to learn more about the PBTF's Northeast Chapter and how to get involved.